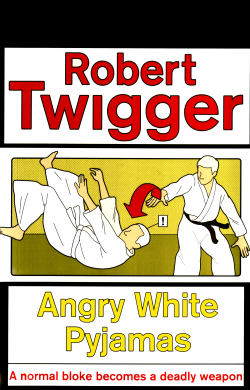 The first time I heard of Angry White Pyjamas, I was still living in Japan, it was among the list of books recommended by expats to understand the darker side of the country, like Dogs & Demons. Someone was supposed to lend me the book, and then I forgot and left Japan. Recently I have started reading about aikidō, and this book appeared again on my radar, I ordered it and read more or less in one go. Angry White Pyjamas tells the story of a british poet, who, stranded in Japan, decides to take the Senshusei course, a eleven month Yoshinkan aikidō training taken by the Japanese riot police apprentices. The first person narrative follows the narrator during nearly a year in which he undergoes the gruelling training with various other gaijin (more athletes and military types than poets) and the Japanese riot police candidates. The book is very well written and captivating, the Robert Twigger, the author won the Newdigate Prize and clearly knows how to write in an interesting and witty style. The story seems to be largely autobiographic, the only claims on the aikidō forums is that he either distorted the story or did not get the course. The latter is unsurprising because the book is pretty critical of the course, its military style teaching which the narrator both loathes and embraces, but also Japanese society and the way martial arts are linked to it. Interestingly, the book made me more think of my army time than of the aikidō courses I’m taking, certainly because aikidō is for me a side-activity, but also because the aikidō I’m doing is under the Aikikai school, not the Yoshinkan, and quite distant from Japan. In a sense this is what makes Angry White Pyjamas so powerful: it is not really about aikidō, but about the struggle of a intellectual person who pushes himself and tries to survive in a militaristic training. In any case, a very good read that I recommend to everybody, interested in aikidō or not. This entry was posted in Books, English, General, Japan and tagged Aikidō, Yoshinkan.